In a study of men with testicular cancer, increasing tumor size relative to testis size was linked with a reduced ability to produce sperm. The BJU International study's findings can be summarized into the rule of 50s: men with a testis tumor occupying greater than 50% of their testis have less than a 50% chance of sperm production in their affected testis. The study included 103 men with testicular cancer. 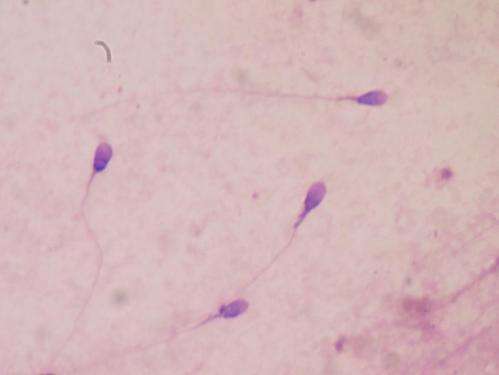 Sperm production was present in 70% of the patients. Testicular cancer is the most common malignancy in young men in their peak fertile years. "Up to 24% of men presenting with testicular cancer have no sperm in their ejaculate at diagnosis, and the treatment can cause further insult to sperm production," said lead author Jemma Moody from the study research team in the Andrology Department at Guy's Hospital, in London. "Patients' infertility and associated concerns need to be broached earlier and given more precedent in their management. The rule of 50s can help guide patients and clinicians at diagnosis regarding fertility counselling and treatment, including referral of patients with no sperm in their ejaculate for onco-microTESE, which involves surgical sperm retrieval from the affected testicle at the time of cancer surgery."